If your question has not been answered, please contact Broadway In Indianapolis Customer Service so that we may be able to speak with you personally. I had an issue at a recent performance and would like to speak to someone about it. How can I contact a customer service representative? You can also call us at 800.793.7469. Our offices are open Monday thru Friday, 9:30am – 5pm. We are also available via e-mail at IndianapolisService@BroadwayAcrossAmerica.com. If you have a last minute issue that needs to be addressed prior to a show, please contact the Broadway in Indianapolis Administrative Office. What hours does the Broadway in Indianapolis Administrative Office observe? What is the address? How can I view a seating chart for the Murat Theatre at Old National Centre or Clowes Memorial Hall? Click here to view a seating chart for the Murat Theatre at Old National Centre. Click here to view a seating chart for Clowes Memorial Hall. Additional venue information is available by selecting your desired theater under our “Theaters” tab at www.BroadwayInIndianapolis.com. 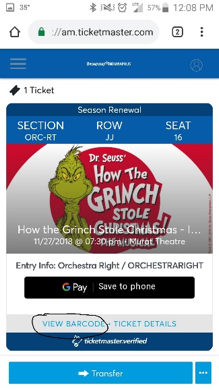 Where do I go to get general information such as directions to the theater, box office hours, and other services offered by Broadway in Indianapolis? Season Ticket Holders should always purchase tickets via the Broadway In Indianapolis Office – conveniently located in the Old National Centre at 502 N. New Jersey Street, Suite 200. Both Old National Centre and Clowes Memorial Hall Box Offices open two hours prior to scheduled performances. For more information, please visit www.OldNationalCentre.com or www.ClowesHall.org. We’ve been there, too. As long as you purchased from an authorized ticket source (Broadway in Indianapolis/Broadway Across America; Ticketmaster online & Ticketmaster outlets; and the Old National Centre or Clowes Memorial Hall Box Offices) we have a record of your sales transaction and can accommodate you. We recommend bringing one or more of the following with you: account number; original method of payment; seat locations; and receipt of your original purchase. Please return to your point of purchase as soon as you discover you have misplaced your ticket(s). Day-of-show: A Broadway in Indianapolis representative will be present and happy to assist you at the theater’s box office. 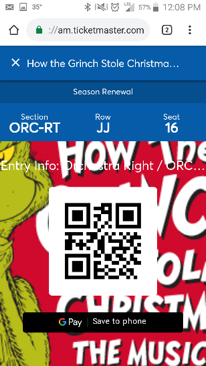 We often times do not have the ability to reprint your tickets, but will issue a seat location pass for the original, confirmed seat locations. Subscribers must bring valid, photo identification when issuing seat location passes. For security purposes Location Passes will not be mailed and are available only at the box office. If tickets were purchased through an unauthorized, third party ticket reseller we cannot guarantee replacement. How can I purchase a gift certificate? How can I redeem an old gift certificate? Click here to purchase a Gift Certificate for Broadway Across America shows in: Baltimore, Boston, Cincinnati, Columbus, Fort Lauderdale, Houston, Indianapolis, New Orleans, and San Antonio. To redeem, call the Gift Certificate Hotline at 1-866-698-7469, Mon-Fri, 10am-5pm. We understand emergencies arise. Please contact the Murat Theatre box office for Murat shows at 317.231.0000, and Clowes Hall box office for Clowes Hall shows at 317.940.6444 to see how we can assist you. What is the appropriate dress for attending a Broadway in Indianapolis performance? Although there is no specific dress code we recommend business casual attire. Some events such as opening nights will draw a dressier crowd. Most people enjoy dressing up to go to the theatre, but you will see people wearing everything from casual for a concert or movie to Sunday best or formal wear for theatrical performances. Where would you recommend parking for my scheduled performance? To learn more about parking at the Old National Centre, please click here. For parking information near Clowes Memorial Hall of Butler University, please click here. We certainly understand serious illness, inclement weather and other extenuating circumstances arise. If you were unable to make the necessary exchange arrangements prior to the show, please contact the Broadway in Indianapolis Administrative Office at (317) 632-7469 in order to discuss your options. Your request must be received within 48 hours of your missed performance. Please note: past-date relocations are only valid for an alternate performance of the same show. This service is available at the discretion of the individual show and according to availability. No refunds will be offered for missed performances. Weekend performances: If you were scheduled to attend a Saturday or Sunday performance please call the venue’s box office and request to speak to the Broadway in Indianapolis representative. Contact information for the Murat Theatre at Old National Centre available here. Please click here for Clowes Memorial Hall’s contact information. Is there accessible seating or hearing assistance available? How do I know which performances offer ASL interpretation or other special services? Accessible seating, assistive listening amplification system, and American Sign Language interpretation are available. For more information please contact the Broadway in Indianapolis Administrative Office at (317) 632-7469. What is the performance runtime? Performance runtimes vary for each show. To find out the runtime for each show click here or visit the “Shows” tab at BroadwayInIndianapolis.com. Click on your desired show’s title for additional information including performance runtime. In the unlikely event a performance is canceled, Broadway in Indianapolis & Ticketmaster will inform guests via phone, e-mail or mail and give appropriate information regarding the show’s ticketing policies. Ticket holders typically must return to their original point of purchase for more information. We recommend patrons check for updates and information regarding their scheduled performance by visiting www.BroadwayInIndianapolis.com, as well as the Broadway in Indianapolis Facebook and Twitter pages. During inclement weather, updates will also be posted on our website and the Broadway in Indianapolis Facebook and Twitter pages. We recommend ticket holders check these sites frequently as any important notices will be posted. At what age can my children attend shows? We recommend parents use discretion when deciding what shows are appropriate for their children. In order to familiarize yourself with each show please click here or the “Shows” tab at www.BroadwayInIndianapolis.com. Please note: A ticket must be purchased for every person attending the show, regardless of age. Broadway in Indianapolis strongly urges all ticket buyers purchase their tickets through an Authorized Ticket source, including: Broadway in Indianapolis/Broadway Across America; Ticketmaster online & Ticketmaster outlets; and the Old National Centre or Clowes Memorial Hall Box Offices. The authorized ticket sources listed above provide a secure, guaranteed seat to your chosen Broadway in Indianapolis production(s). We do not recommend that patrons purchase tickets through unauthorized outlets, online resellers or other ticket sales operations. Additional venue information is available by selecting your desired theater under our “Visit” tab at www.BroadwayInIndianapolis.com. Tickets typically go on sale to the general public 6 – 8 weeks prior to the show’s opening night. The best way to be notified when shows go on sale is to join our Broadway Across America eClub. Click here to join the Broadway Across America eCLUB. Single tickets are available for purchase once your desired production is on sale to the general public by visiting Ticketmaster.com or by calling 800.982.2787. Walk-up sales are available on the night of the show according to availability. Season Subscribers may purchase tickets via their online account, calling 800.793.7469 or by visiting the Broadway in Indianapolis Administrative Office. Can I print my tickets at home? Is there a fee for printing my tickets at home? Tickets are no longer print at home. 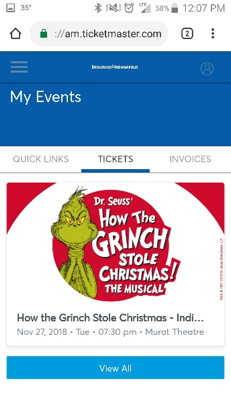 Instead, you can now view your tickets on your phone, and the theatre will scan your tickets directly from your phone! You can find the mobile instructions here. My plans have changed. Can I exchange my tickets? Can I get a refund? Season Ticket Holders of Broadway in Indianapolis enjoy complimentary exchanges. However, there are no exchanges or refunds for single ticket purchases. All sales are final. All exchange requests must be received no later than 48 to 72 hours prior to your scheduled performance. Some shows may different exchange requirements. Contact the Subscriber hotline at 800.793.7469 for more information. Please contact your original point of purchase by phone as soon as you realize you have misplaced your ticket(s). Ticketmaster: 800.982.2787; Broadway in Indianapolis: 800.793.7469. Patron Club Subscriptions (OLD NATIONAL CENTRE: Orchestra Rows A-U, Balcony Rows A-M; CLOWES: Main Floor A-P; First Terrace A-C & First Terrace Boxes A-D) include a $90 fee for each subscription seat purchased. All subscriptions include a $49 Processing fee. Patron Club subscribers receive all the convenience of season tickets, premium seating locations, and additional benefits exclusive to Patron Club subscribers. For more information about subscriptions and benefits, please visit our Season page here. New and renewing subscribers have the option to take part in our interest-free Payment Plan when buying a season ticket package! Opting into the Payment Plan splits the total price of your season package into multiple installments, which we automatically charge to your card at no additional cost. For more information, please call us at 1.800.793.7469 (Monday to Friday, 9am-5pm EST). Renewals for each season usually begin in the first quarter of each year (January – March). Once the new season is announced, you will have until the renewal deadline to pay for your tickets by logging into your online account or calling us at 1.800.793.7469 (Monday to Friday, 9am-5pm EST). Automatic Renewal is an optional program that makes it easy to keep your seats year after year! When we announce the next season, you won’t need to take any action – we will automatically renew your same seats using the card on file. Automatic Renewal subscribers are still able to opt into our interest-free Payment Plan and will receive an invitation to participate in upgrades after the renewal period ends. If you would like to sign up, please call us at 1.800.793.7469 (Monday to Friday, 9am-5pm EST). If you have missed the renewal deadline but would still like to subscribe, please call us as soon as possible at 1.800.793.7469 (Monday to Friday, 9am-5pm EST). 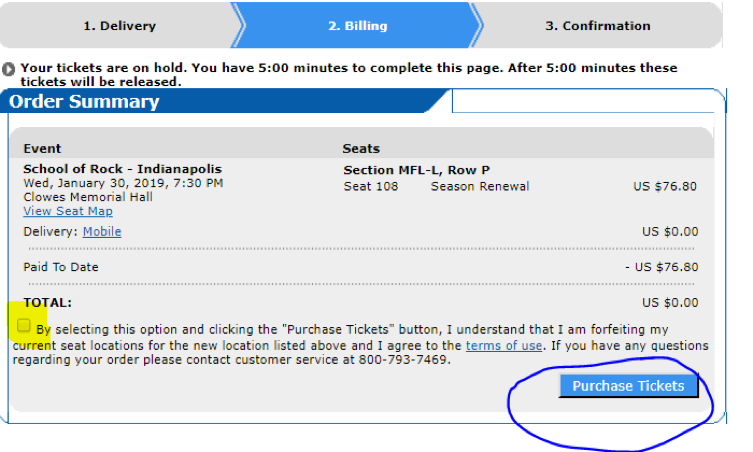 This is one of the best benefits of becoming an Indianapolis Season Subscriber! If you are unable to attend your scheduled performance, you may exchange into another performance of the same production. You may also exchange or upgrade into new seats for the same performance. Unfortunately, comparable seating cannot always be guaranteed. Tickets must be exchanged two business days before your regularly scheduled performance and by Friday at 5:00 pm for Sunday performances for most shows. Bigger shows like Hamilton will have their own policies. 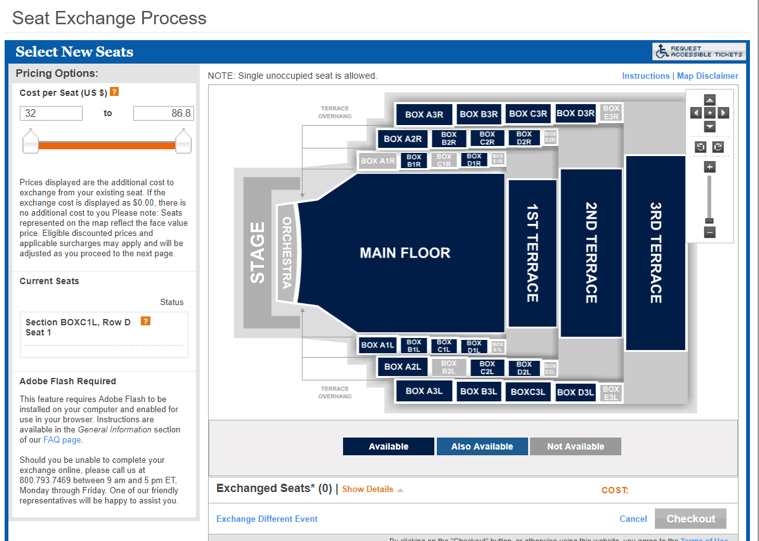 The difference must be paid if exchanging into a higher priced performance or seat location. Your subscriber pricing, if applicable, will be honored if you exchange your tickets. However, when exchanging from a lower to a higher-priced performance or into premium seating, the price difference must be collected when processing the exchange. Exchanges may only be made for a different performance of the same show. If there is a show in another one of our markets that you would like to see, we may also be able to help through our City-to-City exchange program! Please note that all City-to-City exchanges must be completed at least two weeks prior to your original performance date. Please call 1.800.793.7469 (Monday to Friday, 9am-5pm EST) for further information. Once additional tickets and exchanges become available for subscribers, you may add tickets online here or over the phone 1.800.793.7469 (Monday to Friday, 9am-5pm EST). Additional ticket orders for the 2019-2020 season will be limited to 8 tickets per show, excluding Hamilton. Additional tickets for Hamilton will not be offered. Orders that exceed this limit will be cancelled without notice, including multiple orders on the same account, billing address, or credit card. Additional tickets are subject to availability and sold on a first-come, first-served basis (additional tickets for Hamilton will not be offered). To guarantee priority seating, please be sure to order your additional tickets before they go on sale to the general public. Show dates, on sale times, times, prices, and artists are subject to change without notice. Broadway Across America makes ordering tickets for family, friends, and colleagues in a different city easy. Please call our subscriber hotline at 1.800.793.7469 (Monday to Friday, 9am-5pm EST) and our representatives will be able to assist you with the purchase. For a list of cities within the Broadway Across America network, visit BroadwayAcrossAmerica.com. We understand that emergencies happen. If an extenuating circumstance arose and you were unable to make the necessary exchange arrangements prior to the show, please contact Broadway In Indianapolis as soon as possible at 1.800.793.7469 (Monday to Friday, 9am-5pm EST). During the weekend, please call the venue box office directly (Murat Theatre: 1.317.231.0000; Clowes Hall: 317.940.6444). No refunds can be offered for past shows, and we will not be able to make accommodations after a show’s final performance. If your subscription tickets have been misplaced or destroyed, contact Indianapolis at [1.800.793.7469 (Monday to Friday, 9am-5pm EST) or email us as soon as possible to request a reprint. If you wish to purchase accessible seats for a subscription, please email us. You may email us, or send via standard mail to our office at 502 N New Jersey St., Ste 100, Indianapolis IN 46204. Please be sure to send transfer requests well before the renewal deadline! Once new accounts have been created only the new account holders will be able to manage their tickets. During the renewal period, you may call us at 1.800.793.7469 (Monday to Friday, 9am-5pm EST) to see if there are any options for changing your seats. Bear in mind that our inventory may be limited or unavailable at this time. Please include your account number, address, telephone number and e-mail address as well as your friend’s information. Payment must be received by the printed renewal deadline. Upon processing your request we will confirm by phone or e-mail. I would like to change my seating for a specific production. What do I need to do? As a Season Ticket Holder you are able to exchange or upgrade your seats for another performance of the same production. Please contact the Broadway in Indianapolis team to discuss your options. Life is a balancing act – we’re here to help! Flexible exchanges are one of the best benefits of becoming a Broadway in Indianapolis Season Subscriber. If you are unable to attend your scheduled performance, subscribers may exchange their tickets for another performance of the same production. 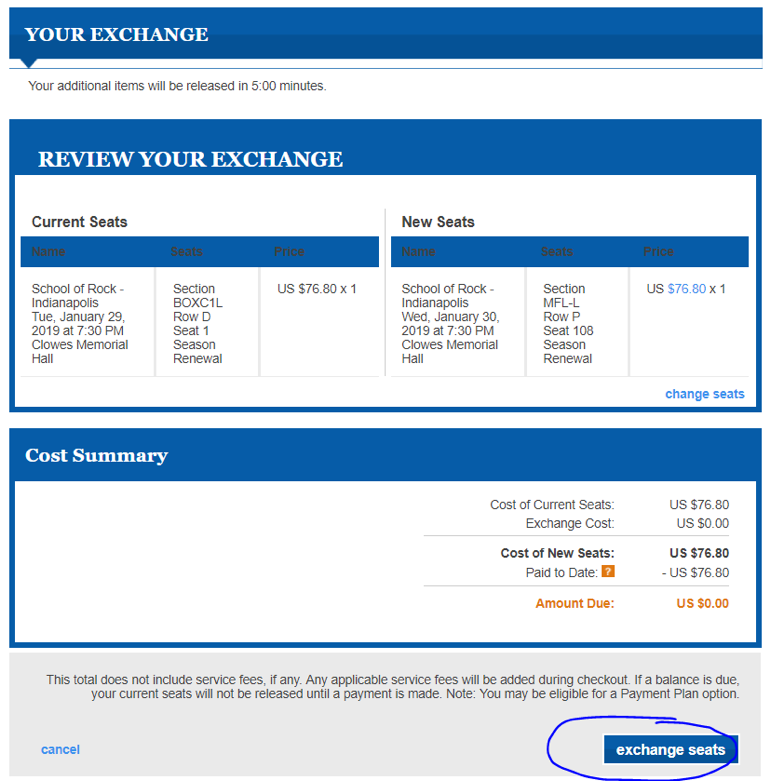 We make every effort to place you into comparable seating when exchanging, however this is not guaranteed as it is according to available inventory. 1. 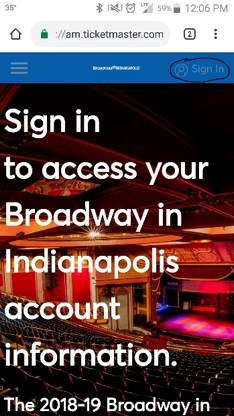 Login to the Subscriber’s online account here, via BroadwayInIndianapolis.com. Under the “Subscriptions” tab at the top of the webpage, select “Manage My Tickets” and login using your account number or e-mail address and password. 2. Call the Broadway in Indianapolis Subscriber Hotline at (800) 793-7469. 3. In person at the Broadway in Indianapolis Administrative Office. Please note: Tickets must be in hand when exchanging by phone. All exchange requests must be received no later than 48 to 72 hours prior to your scheduled performance. Some shows may have different exchange requirements. Contact the Subscriber hotline at 800.793.7469 for more information. All Saturday or Sunday performance exchanges must be processed by end-of-day Friday. All exchanges are free. When exchanging from a lower to a higher priced performance or price level, the difference will be collected when processing your exchange. Non-subscribers who have purchased their tickets through Broadway Across America may exchange their tickets for another performance of the same production, as well, but this service is subject to a $25.00 per order exchange fee. There are no refunds or exchanges for tickets purchased via Ticketmaster.com, Ticketmaster outlets, or the Old National Centre and Clowes Memorial Hall Box Offices. How do I change my address, phone number or e-mail address? 2. E-mail IndianapolisService@BroadwayAcrossAmerica.com along with your account number, telephone number(s) and your new address. I don’t know my password. What do I do? 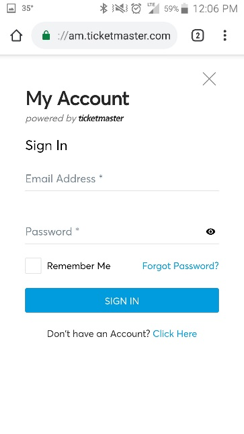 Under the “Subscriptions” tab on our website, select “Manage My Tickets.” Click “Forgot Your Password,” enter your account number or e-mail address associated with your account and a temporary password will be emailed to you. If you do not have your account number or password, or do not know the email address registered to your account, please contact the Broadway in Indianapolis Subscriber Hotline at 800.793.7469. If you are receiving an error message, please call us at 1.800.793.7469 (Monday to Friday, 9am-5pm EST) or email IndianapolisService@broadwayacrossamerica.com for assistance. If you have forgotten your password, click here to visit the login page. Click on “Forgot Your Password,” then enter the Account Number or email address associated with your account. A temporary password will be emailed to you – click on the link provided in the email and enter your new password. If you do not have an account or password, or do not know the email address registered to your account, please contact our customer service hotline at [at 1.800.793.7469 (Monday to Friday, 9am-5pm EST). Many performances do offer special rate to student and senior groups. Please contact Chris Schneider at 317-632-5183 or Chris.Schneider@BroadwayAcrossAmerica.com to discuss the various options available to your group. Do we need to wait until tickets go on sale to the public or can we book our seats now? Groups can book their seats in advance of the general public. Group sales generally start in mid May, but you can call and have your name placed on our priority list starting the day of our season announcement! Does my group have to be placed together? Not at all! We understand some group members will love an up close experience while others prefer a balcony or terrace view. No matter where you are located, your group is sure to have a wonderful time. As long as the minimum group amount of tickets is met your group may spread out throughout the theatres – in various pricing levels, rows and sections. Group clients may reserve their tickets in advance and will be invoiced for their seats to allow you time to collect funds from your group members. Our Group Sales Department can give you more details on the payment options upon reservation. Please contact Chris Schneider at 317-632-5183 or Christopher.Schneider@BroadwayAcrossAmerica.com. While Broadway Across America has many cities in its network, we are only able to help you with Group Sales in Indianapolis. However, we’d be happy to put you in touch with our colleagues in other cities so you may book your group tickets. You’ll be sure to get the same great service from our colleagues as you have from us! For a full list of cities in our network, please visit www.BroadwayAcrossAmerica.com. If you are receiving an error message or having trouble with a Groups purchase or Promo Code, please call us at 317632-5183 or email Christopher.Schneider@broadwayacrossamerica.com for assistance. Transferring tickets is free and easy to do! If you have any problems, please call 1.800.793.7469. 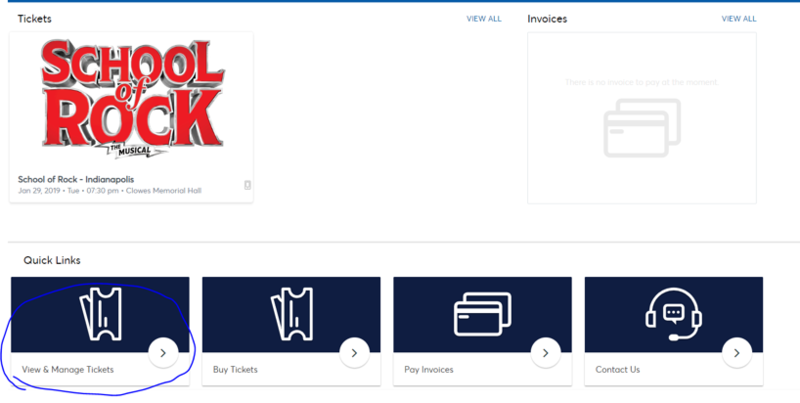 Click HERE to log into your account, or go to SUBSCRIPTIONS, then MANAGE MY TICKETS. 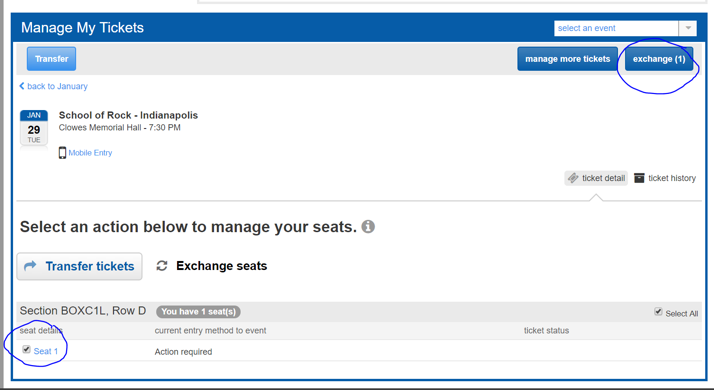 Under Quick links, click View & Manage Tickets. Click on the event you would like to transfer. Next, click on the Send button to bring up the Transfer screen. Click on the seat to select it, then click SEND. Fill out all of the recipient information with a valid email address and click SEND. After the transfer is completed, click DONE to return to your account. If exchanging into a higher priced performance or seating location, you will be responsible for paying the difference. If you exchange into a lower priced performance, you will be refunded the difference. If you have any issues with the exchange process, please call 1.800.793.7469. Click on the event you would like to exchange. Click on the button with the elipses in the upper right corner, next to the SEND button, to bring up the Exchange option, then click on EXCHANGE. 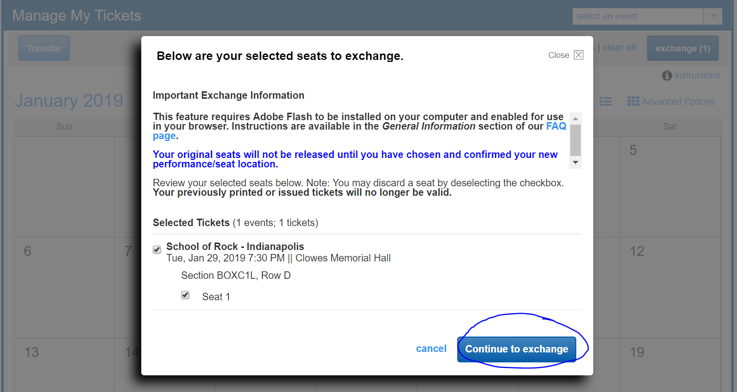 Check the box next to the SEAT LOCATIONS (S) you wish to exchange, then click the EXCHANGE button in the top right hand corner under “Manage My Tickets” section. Click CONTINUE TO EXCHANGE in the pop up window. Select the new date you wish to attend the show and then click CONTINUE. Using the seating chart, select your new seats, then click CHECKOUT. 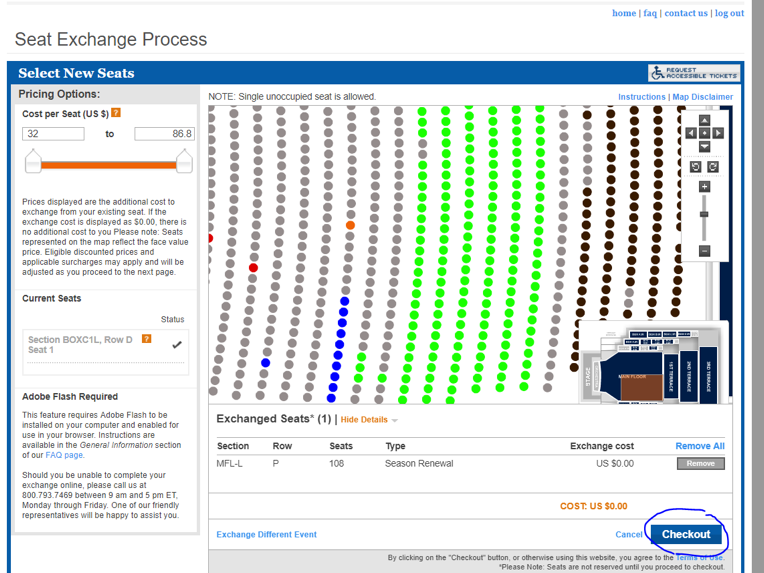 Review the details of your exchange, making sure to double check the new show’s day, date, time, seat location, and number of seats. Once confirmed, click EXCHANGE SEATS to proceed to the payment checkout process. Go through the checkout process to select your Delivery Method and your Payment Type (if required) to complete the exchange. 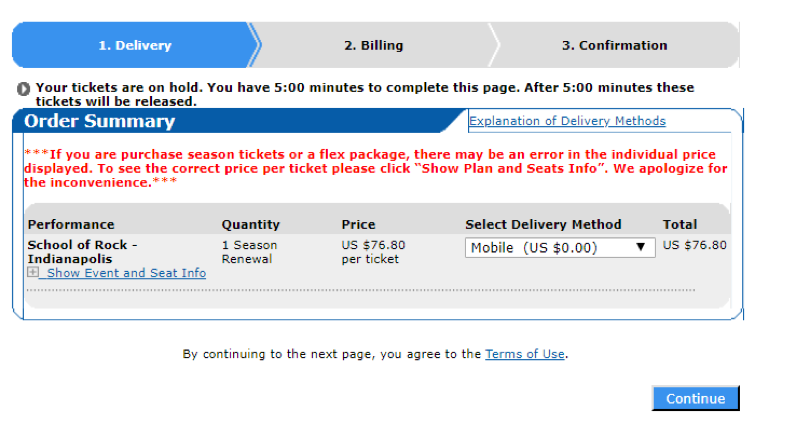 Your original seats will not be released until you check mark the box to agree to the terms and click PURCHASE TICKETS. You will receive an email with the confirmation of your exchange.